Vaishali Enterprises is known for offering a fine range of Velvet Pencils, Velvet Pencil Making Machine, Velvet Pencil Gum, Velvet Pencil Sharpener, Velvet Powder, Plain Pencil, Flock Machine, Polymer Pencil in the market. Over the years, we have gained a reputation of trusted Manufacturer and Supplier of these pencils by offering highest quality in our products. Our firm has endowed on the infrastructure, to ensure that the business operations are accomplished smoothly. Our importance on quality backs us in making a mark of excellence in every project that we undertake. The tremendous success of our organization is also due to the dedication and hard work of our team that helps us to attain complete client satisfaction in every endeavor. 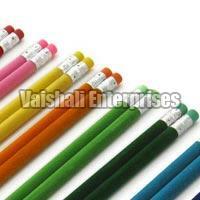 We also offer Velvet Pencil Coating services to the clients.